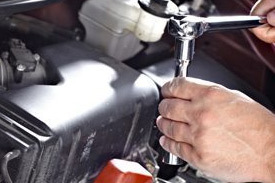 Tune-Ups | Auto Tune-Up Mechanic | Metro Transmission Inc.
Tune-up services from the best! A properly tuned vehicle is one of the best ways to maximize its performance and efficiency. Tune-­ups will improve gas mileage, increase power, and decrease the chances of major repairs later down the road. Another important aspect of a tune-up from Metro Transmission and Automotive is that it gives us the opportunity to catch any warning signs of damage or wearing that may normally be overlooked. Tune-ups are recommended based on the year, make and model of the vehicle, as well as the type of driving you are doing. Certain vehicles that are used for commercial purposes such as towing or hauling heavy items may require more frequent service. Below we have included samples of several items that are inspected and/or replaced when getting a tune-up from Metro Transmission Inc. Spark plugs, plug wires, coils or coil packs. Overtime these components may go bad and this may have a negative effect on your vehicle’s efficiency and power. Inspect for any worn or squeaky belts. Check all vehicle fluids for level and condition and top off where needed. Adjust and check clutch in manual transmission vehicles. Inspect battery, cables, and terminals. Inspect for leaking, worn or damaged hoses. Inspect the cabin filter if equipped. The tune­-up process will vary depending on your specific vehicle, therefore certain items may or may not be on this list. We always make sure to follow the manufacturer recommendations for your year, make and model.